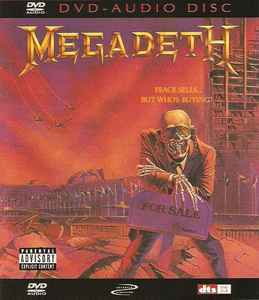 Megadeth ‎– Peace Sells...But Who's Buying? Audio tracks featured in DVD-A 5.1 surround, DTS 5.1 surround, and PCM 2.0 stereo, all with 96K sample rate and 24 bit depth. Bonus features include exclusive interview footage and "Play Along" versions of "Devils Island" (different tracks of the song). Also has lyrics and photo gallery. "5.1" in the credits refers to the 5.1 surround-sound mix. In case anyone is wondering, this is the original audio not the "remastered" version with re-recorded tracks from 2004. So even the stereo track sounds fantastic.